Edgar Sanchez Lopez is a second-year civil engineering student who received TheDream.Us scholarship. 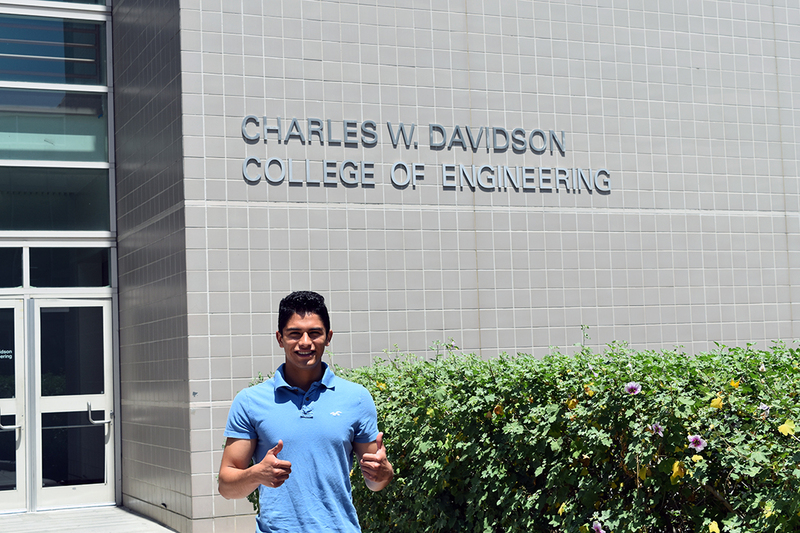 Edgar Sanchez Lopez just finished his first year at San Jose State and he is already thinking ahead to next fall, when he will take physics and a civil engineering surveying course. 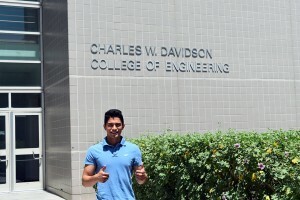 In his second year, he wants to get involved with the American Society of Civil Engineers student chapter to connect with his peers and he wants to find an internship to get real-life experience in his field. Sanchez Lopez speaks confidently and his near perfect English belies the fact that he has lived in the United States for less than a decade. He moved to Mountain View from Mexico City when he was 10. His father moved six months ahead of the family, then Sanchez Lopez, his mother and younger sister joined him. Like 550 other San Jose State students, Sanchez Lopez came to California as a child as an undocumented immigrant. He is one of eight SJSU students who received TheDream.US National Scholarship in 2015-16. The scholarships are provided through a program of the nonprofit New Venture Fund that grants renewable scholarships to eligible students who have been accepted for Deferred Action for Childhood Arrivals (DACA) by U.S. Citizenship and Immigration Services. SJSU is one of fourteen universities and community colleges in California who have partnered with the TheDream.Us scholarship program. An additional 30 incoming SJSU students have received scholarships for 2016-17. The scholarship covers the cost of tuition and fees, up to $25,000 towards a bachelor’s degree. Sanchez Lopez recalls his early days in California. He took ELL classes and became more comfortable with English. Sanchez Lopez enrolled at Los Altos High School, where he participated in the Advancement Via Individual Determination (AVID) program that aims to prepare high school students for four-year universities. The AVID program provided mentorship and advice about the college process, including an explanation of what a personal statement is and how to apply for scholarships. Due to California State Assembly Bill 540 (known as the Dream Act), Sanchez Lopez is eligible for in-state tuition and received a Cal-grant, but is ineligible for any federal financial aid. While he worked full-time in high school and managed two part-time jobs in his first year at San Jose State – as a tutor and working at an Express clothing store – he said the scholarships he received helped him to scale back on his work schedule without asking his parents for financial support. Before applying to college, Sanchez Lopez initially wanted to be an architect. He realized his true passion is for building and not drawing. When he was not accepted at his top-choice school, UCLA, he quickly learned about the prestigious reputation of SJSU’s Charles W. Davidson College of Engineering and warmed to the idea of studying civil engineering closer to home. Sanchez Lopez joined study groups and visited his professors during office hours. “I had to change my study patterns and work less,” he said. Now that summer has started, he is back to working two jobs to save up money for the fall semester. He is optimistic that he will stay on a path to graduate in four years and he plans to become a structural engineer who builds skyscrapers. His role model is an aunt who is the only one in his family to go to college. He also tries to be an example for his younger sister who is 15 and will be a high school junior in the fall. “I can help her out with her college applications because I went through the process,” he said. For more stories of undocumented students at SJSU watch The Undocumented Story by Tina Castellanos, available below.